The best view in St. John’s may actually be indoors, here at the Johnson GEO CENTRE! Definitely out of the world. We hear people rave at least as often and enthusiastically about our own solar system as they do the other one. You’ll see it from our upper lobby, or as soon as you step into our glass-walled elevator, and you’ll know right away that, at the Johnson GEO CENTRE, you’re in for something truly out of this world. 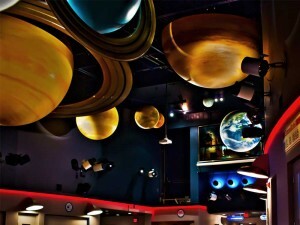 The solar system hangs above the grand Reception Hall. Planets as high as a two-story building, hanging above and welcoming you to an experience like no other. This is the Johnson GEO CENTRE.